Helen is a poet, editor and tutor based in Devon, whose debut poetry pamphlet, Only by Flying, was published by HappenStance Press in November 2015. She was a glider pilot for 25 years and this experience has been a major inspiration for her poetry. Flying is one of the key themes in her pamphlet. About half its poems are about it: birds as well as gliders. Helen began her working life as a journalist, and started gliding in 1988. Between 1999 and 2008 she combined her career with her hobby as editor of the sport’s national magazine, Sailplane & Gliding. She was awarded a 2009 Certificate of Merit by the Royal Aero Club of the UK. In 2007, thanks to an evening course led by Greta Stoddart, she started to write poems in earnest again. 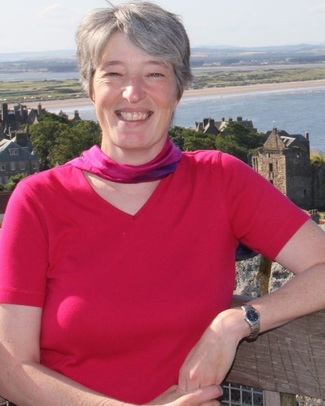 She went on in 2010 to gain an MLitt in Creative Writing from the University of St Andrews, where her tutors were Robert Crawford, Kathleen Jamie and Don Paterson. Her poem Night Crossing came third in the Manchester Cathedral prize in 2010 and her work has appeared in various magazines, including The Rialto and The North, Obsessed with Pipework and The Broadsheet. She has read at various festivals and venues in the South West. Since 2011 she has worked each year as a tutor on the University of St Andrews’ Creative Writing Summer Programme, which is directed by Jonathan Falla. Helen runs workshops, gives readings and can offer feedback on and help you edit your writing. You can find out more at www.helenevans.co.uk and www.facebook.com/helenevanswriter. trawled up, immersed in air, then thrown back drowned. Caught up with them, razor clams and whelks. Lost net-floats. Plastic bottles. Brittle stars. Kelp, its fronds and holdfasts caked in tar. the old, all carapace and barnacles. And sea urchins, stripped bare, like sand-filled skulls.